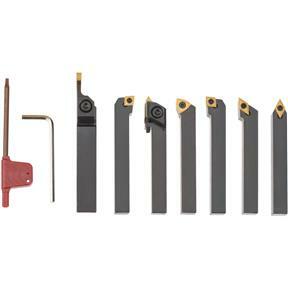 7 Piece Indexable Carbide Set 3/8"
Grizzly T10293 - 7 Piece Indexable Carbide Set 3/8"
This 3/8" shank, 7-piece turning tool set is ideal for a wide variety of projects. 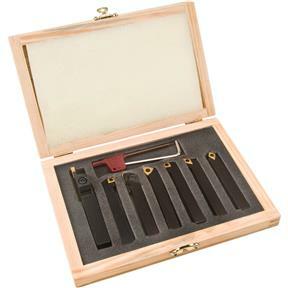 Supplied with right hand and left hand turning/facing tool holders, the set is complimented with one threading and cut-off tool too. Indexable inserts ensure cutting surfaces stay sharp. Finally got a chance to really use this set. Cuts really well, and the different cutters do their specific turns nicely with a very usable finish. I'm running mini lathe, and working mild steel, and these are more than enough for that task. 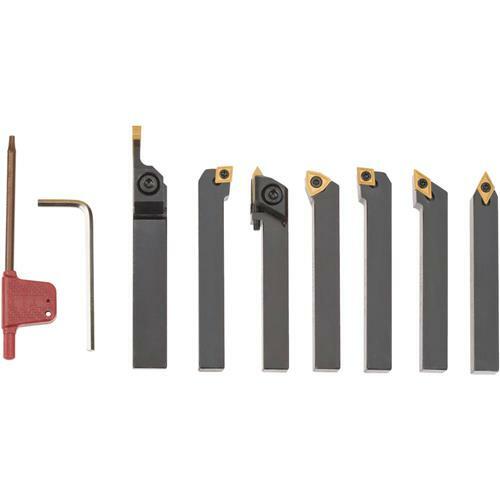 Very good set, pretty much all I use, only problem I have is the cutoff tool doesn't work very well for me; probably just noobish setup issues, I use the high speed Steel cutoff tool instead because of the easier setup by just grinding it to fit. All in all a great set for beginners like me. I have not had a chance to use them yet, I did not receive my lathe yet. 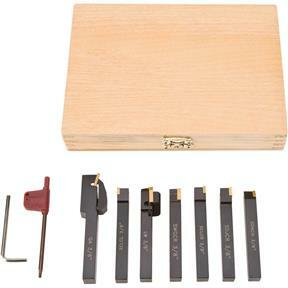 As a gunsmith I need smaller, more versatile tooling, and these holders fit the bill. I received my order, opened the box and was surprised to find one tool missing. don't get much better than that. Russ Hamilton, Action Gunsmithing. I've only used two of the tools but they worked great giving extremely smooth cuts on steel and aluminum. The item arrived very quickly also.